Well, today is the hottest day this summer and I surely hope the last one. I just simply despise heat! I wanted to cool down so much I couldn’t find myself a place until I got home 😛 Yes, we invested into AC, few months before and I’m damn happy! 36C (97F) outside and a nice mellow 21C (70F) inside!!! When the heat pours so strong from the sky, I can only think about ice cream… My favourite is Big Milk from Algida… cos it reminds me of my childhood favourite BAMBINO – mmmmhhh vanilla cream… But but but… no creamy ice cream from the store cos they contain tons of white sugar, which really I try to avoid. 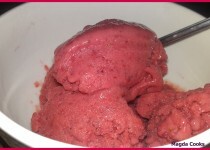 Some time ago, I posted awesome goey diet banana ice cream… couldn't believe it was so tasty and so guilt free… This time I didn't have bananas, so I raided my freezer and I found a pound bag of frozen strawberries… yummy! I thought and left if for 20 minutes on the counter. Did some boring chores, like loading washer and re-arranging pantry shelves then came back and just made my huge portion of cold strawberry delight. Leave the bag out for 20 minutes. 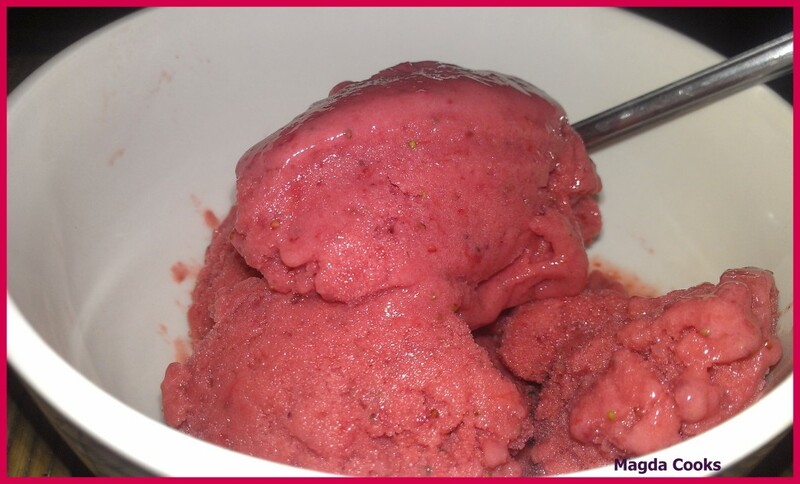 Put the softer, but still frozen strawberries into blender bowl and start blending. Blend until strawberries are smooth. Add milk and blend for another 5s. P.S. Cookies thoughts: Can’t deny it worked. And Magda...hmmm, she didn't cook nothing this time, so lets embellish a little and say, Magda Cooks Prepared... it just right.